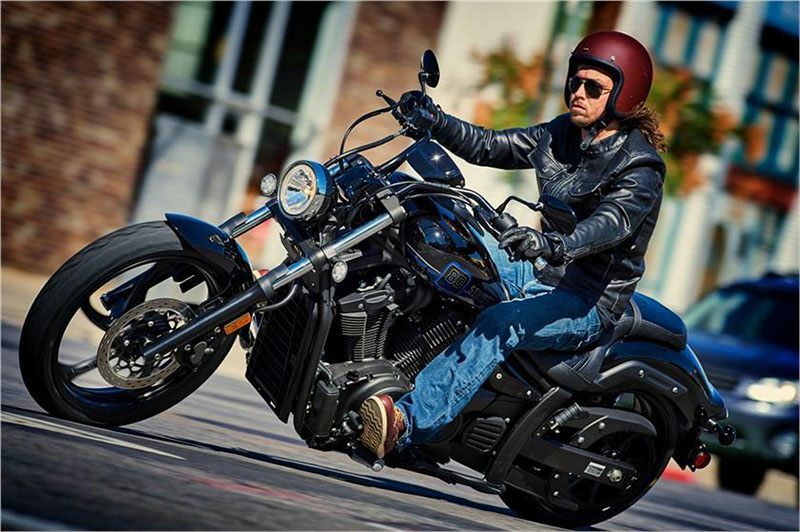 CLEAN DETAILING: Aggressive, tough custom styling theme sets Stryker apart, with sharp detailing like the beefy 1” handlebars that connect right to the upper triple clamp for exceptionally clean looks. EXCELLENT LIGHTING: Bright multi-reflector headlight, LED taillight, and custom amber LED turn signals behind clear lenses give a custom look. DETAILED INSTRUMENTS: Stylish instrumentation includes an analog speedometer along with LCD display with twin trip meters a fuel trip meter and a clock; indicator lights for high beam, turn signal, low oil level, low fuel, coolant temperature, neutral and engine diagnostic functions. 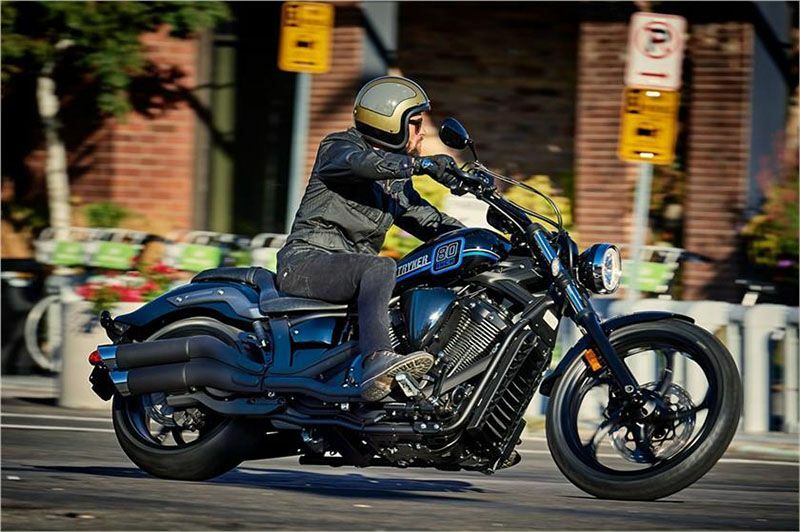 BALANCED CHASSIS: The open neck double cradle steel frame has four solid engine mounts, including one atop the front cylinder head giving the bike a rigid base for precise handling not normally found on a raked out custom. KICKED-OUT FRONT FORK: The 6° yoke and raked triple clamps combine to provide a total of 40° of fork rake. This achieves the aggressive raked out styling image and solid straight-line performance you’d expect, while at the same time providing light, nimble handling characteristics, even at low speeds. REAR SUSPENSION: The rear suspension is a bottom-link-type Monocross system with a gas charged single shock with adjustable spring preload. 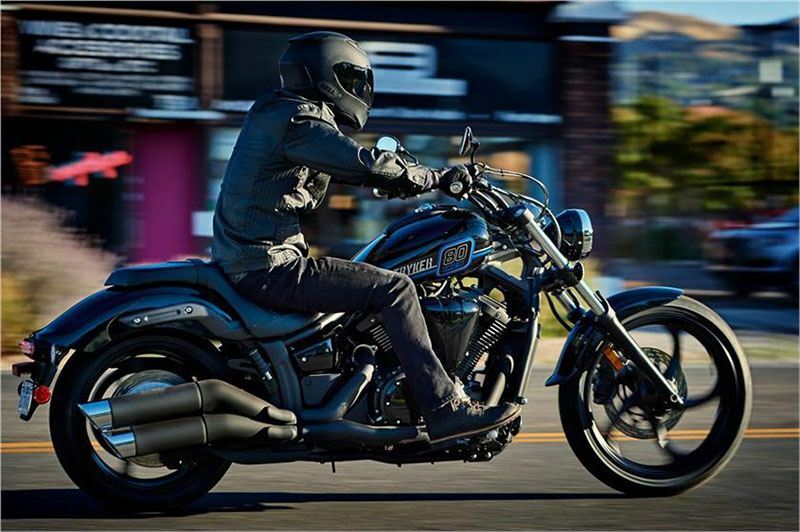 Settings are calibrated to deliver a plush ride that is increasingly firm as the suspension is compressed for good handling and comfort over bigger bumps in the road. 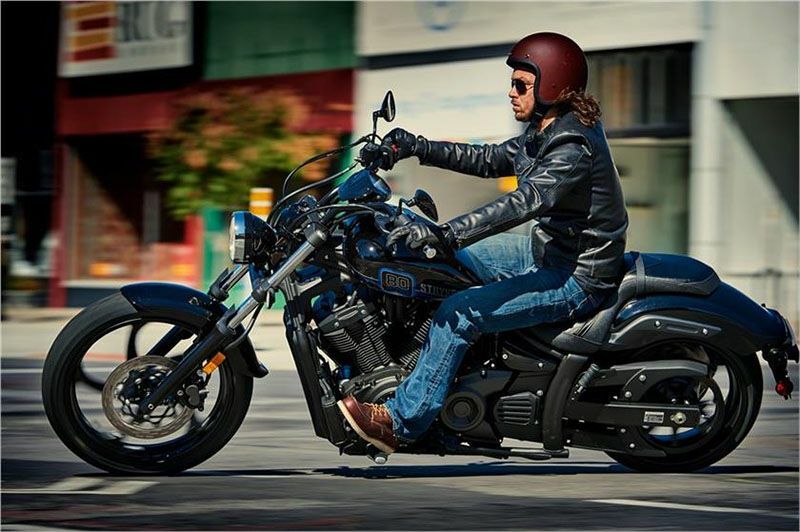 LOW SEAT HEIGHT: Seat height is low, just 26.4 inches, letting the rider feel in rather than on the bike when riding, and enjoy having both feet planted firmly on the ground when stopped. REAL STEEL FENDERS: Steel fenders—rather than cheap plastic fenders found on some competitors—are one of this bike’s authentic cruiser features. Steel fenders are ideal for customizers who want to cut, chop or modify their bikes. STYLISH CUSTOM WHEELS AND TIRES: Aluminum wheels have low profile tires. 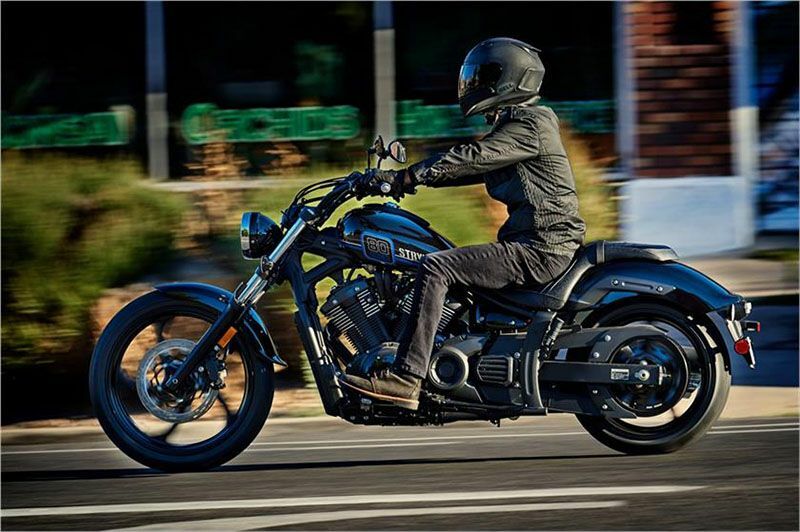 A wide 210-series rear tire and 21-inch front wheel add to the aggressive attitude of the bike. 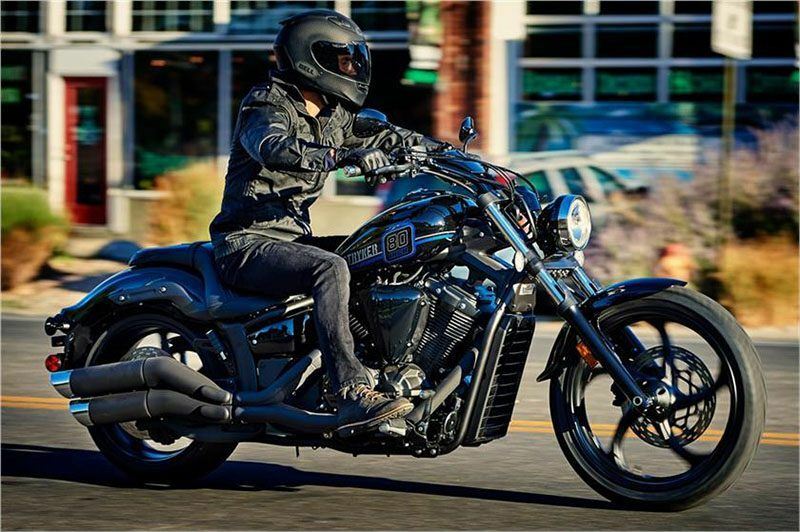 PURE CRUISER ATTITUDE: The relaxed riding position is complemented by the carefully chosen handlebar position, which puts the rider’s arms comfortably level with the horizon, for a “fists-punching-the-wind” attitude. 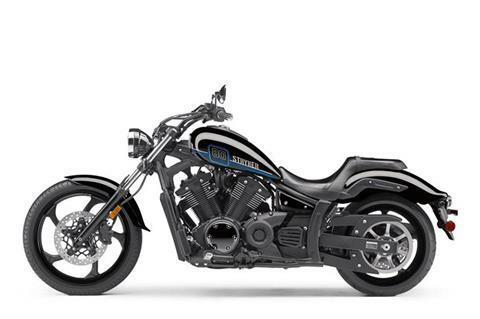 STAND OUT FIT-AND-FINISH: When Stryker is parked, it’s sure to draw attention. 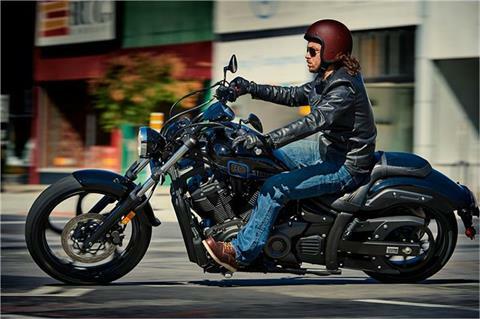 The richly sculpted rear fender over the wide rear tire, the low sculpted seat, the forward mounted foot controls and blacked out components make the Stryker stand out from the competition. With a fit and finish that’s usually reserved for hand-made customs, it’s clear this is no run-of-the-mill cruiser. POWERFUL BRAKES: Large 320mm front and 310mm rear discs provide serious stopping power. 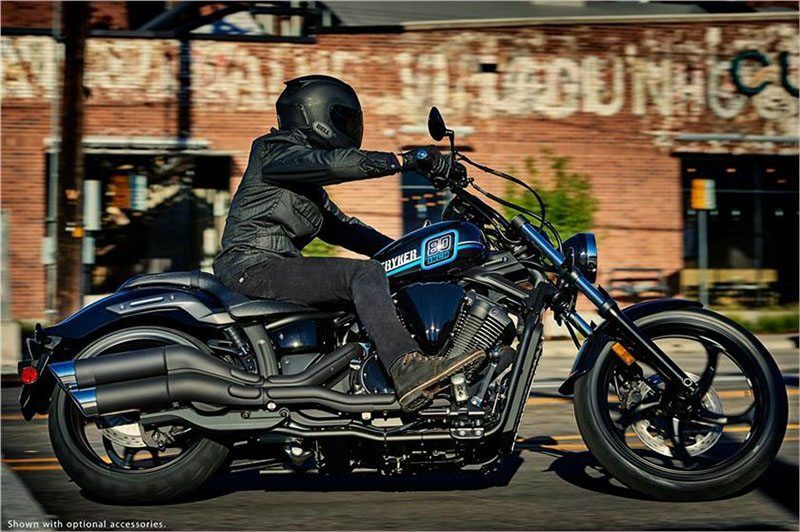 POTENT, CHARISMATIC ENGINE: The 80-cubic (1304cc) liquid cooled SOHC 60° V-twin engine, with four valves per cylinder, 9.5:1 compression ratio and dual counterbalancers, delivers smooth power to the ground, while maintaining the classic big cruiser sound and pulse characteristics. HIGH PERFORMANCE CYLINDER HEADS: Four valves per cylinder (36mm intake, 32mm exhaust) provide optimum combustion efficiency. Roller rocker arms reduce friction for better performance and reduced wear. FORGED PISTONS: High-quality forged aluminum 100mm pistons have a lightweight, high-strength compact design that contributes to high performance and reduce vibration. 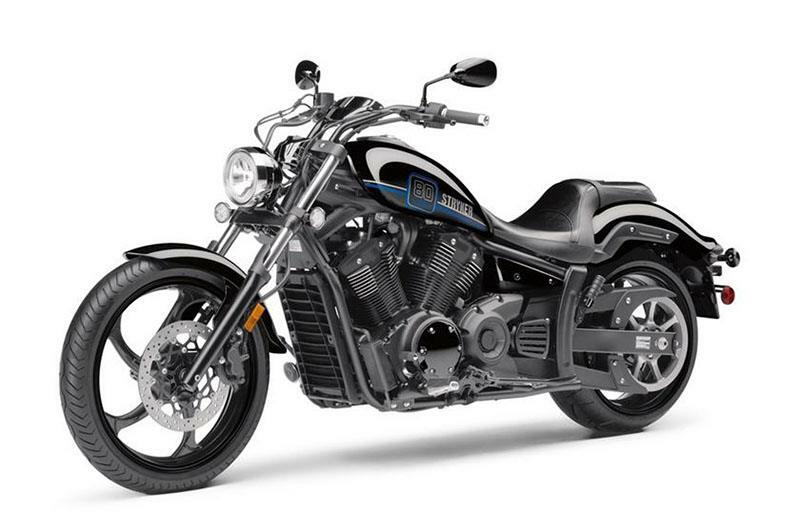 YAMAHA FUEL INJECTION: Sophisticated twin bore fuel injection is used on the Stryker. Each cylinder is fed by its own injector spraying into twin 40mm throttle bodies, while the computer-controlled system provides a precise amount of fuel/air mixture to the engine for optimal performance in all conditions. 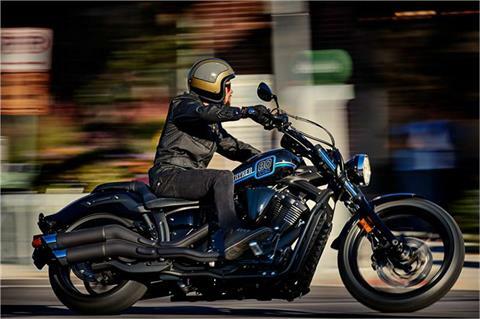 The result is strong, smooth and seamless performance across the full range of engine rpm. 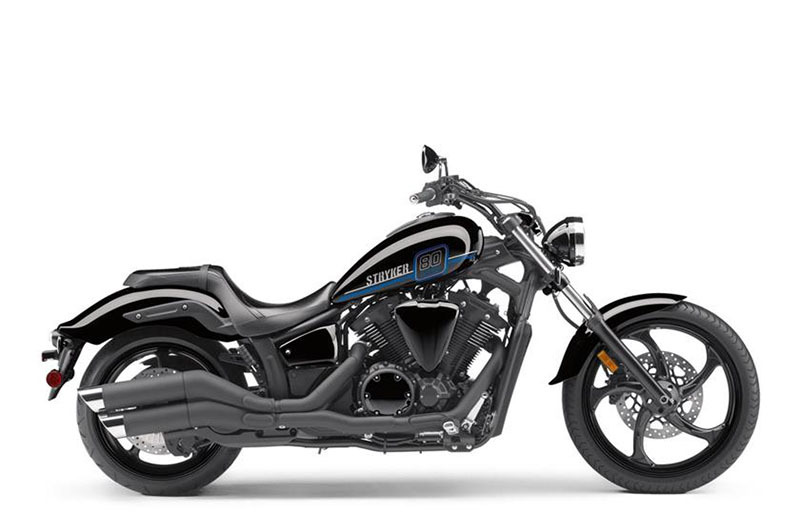 THROATY EXHAUST: The exhaust system, designed specifically for Stryker, adds to the awesome look of this bike while also optimizing its engine performance—and it has a magnificent exhaust note. CLEANLY STYLED MOTOR: The classic cylinder fin styling of an air-cooled engine with a sly cooling system that routes liquid through hidden hoses and internal engine passages for air-cooled looks and liquid-cooled performance. Oil filter is easy to get to but also tucked nearly out of sight for clean looks. REAL WORLD CHOPPER STYLE: The look reinterprets classic custom chopper styling for an aggressive feel. High-end looks without the high-end price tag. POTENT MOTOR: Gutsy 1304cc, fuel-injected liquid-cooled V-Twin engine churns out the inspired, big-engine feel riders will love. 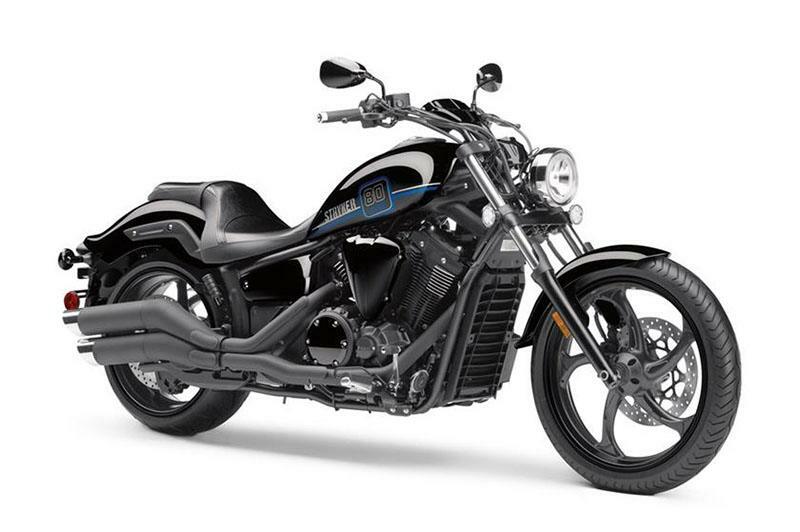 AGILE HANDLING: Even with its radically raked out front end, Stryker® has the superbly nimble and lightweight handling that choppers and mid-class competitors can only dream about. LOW SEAT HEIGHT: Low seat height (26.4 inches) allows riders to put both feet on the ground and helps provide this bike’s natural, relaxed and comfortable riding position. STYLISH CUSTOM WHEELS: Custom 5-spoke aluminum wheels carry a wide 210-series rear tire and chopper-inspired 21-inch front wheel that reinforce the muscular styling of the bike. REAL STEEL FENDERS: No cheap plastic fenders here—this authentic cruiser has real steel fenders customizers love. Classic belt drive, too. 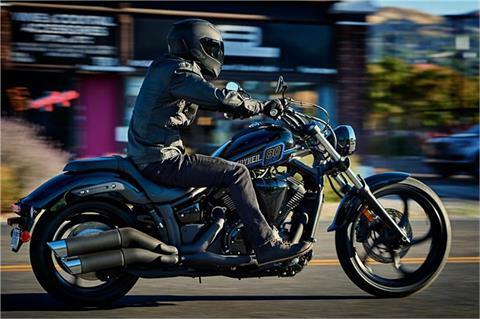 READY TO CUSTOMIZE: Get started on your own customization with two trim packages in high-quality chrome, or an aggressive looking, blacked out package. The Star® Accessories Catalog is packed full of high-quality parts that invite Star owners to fully express their individuality.